It's down to the absolute, final, last, no-fooling or fake outs leg of the 9th edition of The Amazing Race, one of the most competitive and bitterly fought in memory. 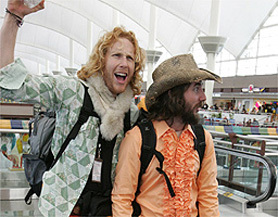 BJ & Tyler get to leave first after winning their fourth separate leg of the race, at 12:18 a.m. Their first clue sends them back to the United States, in Anchorage, Alaska. Maybe they'll find the bodies of the Guidos from Season 1. They pay back Ray & Yolanda for their previous generosity by leaving 2000 Yen on their window (about 20 bucks, so it's not that big a deal). The Greatest Every In The History of Man Award for Hyperbole goes to Tyler at this point for claiming that they've been training for this race their entire lives. Really? Before it even began? That's some foresight, my friends. Eric & Jeremy are two minutes behind, vowing eternal revenge against the other teams. Good luck with that. They offer a bad imitation of dubbed kung-fu movies (That's Chinese, you morons), with Jeremy sending dorkometers skyward by demonstrating his "chicken kung-fu". The two teams are mostly racing side by side on the freeway to Toyko, with a split happening when Tyler decides to use his Super-Gaijin power to find a quicker route. This leads to much laughter from Eric & Jeremy, followed by, "I hope this is the right way." Ray & Yolanda are last out for the day at 3:01 a.m., still convinced they're the best team left. Hey, the last time we had a real Amazing Race, the last team and the second-to-last leg won it (with some producer interference), so anything's possible. But first they have to get out of Japan with naught but their wits and 2000 Yen. When Eric & Jeremy do arrive, the clerk mostly gets the idea behind withholding the info, at first saying they can use the Internet, but that they don't have it there. You'd make the best spy, dude. Ray & Yolanda stop by a restaurant on the way in hopes of getting some money with their sob story. A group of inebriated Japanese businessmen take pity on them, one comparing Yolanda to Janet Jackson. I mean, maybe if you were really really drunk and... oh. "I'll tell Michael, you said hey." Ray & Yolanda (Miss Brown-Moore if you're nasty) get a few thousand Yen out of them, and are feeling a lot better about their chances. Back at the hotel, BJ has found a flight to Anchorage via Seattle arriving at 10:53 the next morning. Although they've denied the use of the Internet to Eric & Jeremy, they do still know how to work a phone and manage to find an earlier flight, giving them 3 full hours on them. That's a nice Karma Whack right there. BJ & Tyler wander back down to the lobby and spot the Frat Boys, and an awkward conversation ensues where neither team can say much of anything. Both catch the same shuttle to the airport, where Eric & Jeremy are quick to hide, lest the Hippies discover their earlier flight. Meanwhile Ray & Yolanda are just catching the shuttle to the airport, hoping they'll spook the other teams just by their presence. The Frat Boys sneak off to catch their flight, while the Hippies, to their credit, don't stand pat with their Northwest flight, discovering a flight that gets to Anchorage at the same time but by a different route. It looks like Ray & Yolanda might get left behind, as they just now arrive at the airport. They do some searching and discover the same connection as the Hippies, but are told by the agents (who recoil at Ray's unconsciously threatening and aggressive body language) that the flight is now closed. Making a call, they are able to get on the flight, with minutes to spare, essentially tying the race. The teams disembark in Alaska on the same flight, with shiny new parkas. With two of the teams having no baggage and the other not seen hauling around parkas, this definitely looks like some producer supplied gear. But come on, wouldn't watching these teams freeze to death by hours of fun? The clues waiting for them in their provided cars tell them to get to Mirror Lake. All teams get directions from the parking attendant, though Ray & Yolanda just don't trust themselves with directions anymore. Best team remaining indeed. Arriving at the lake, the teams find the Detour clue, a choice between setting up a ice fishing shack and loading up a bush plane to fly 150 miles and deliver medical supplies. In what might be a first for the show, a Detour is held up by the weather, as BJ & Tyler are told they would have to wait indefinitely to load up the plane. The obvious choice is to then build the ice-fishing camp, consisting of 10 augured holes and a shack. This takes me back to days on Emma Lake. The Hippies and Frat Boys get to work drilling through the ice, which proves to be tougher than it looks. Eric & Jeremy prove to be just that must faster at this than the Hippies and complete this Detour first. They're then sent to nearby Kincaid Park to search for a clue using snowshoes. The Hippies are right behind them, and where are Ray & Yolanda, you might ask? Well, asking for directions of course. They get there just as the Hippies are leaving, and go for the more physical task, of course. If this race consisted of nothing by tasks, they'd be in much better shape. Eric & Jeremy get to the chalet at Kincaid Park first and hustle out onto the course, mostly to try and hide from the Hippies. As it turns out, they could have stayed an hollered at them, as BJ & Tyler morph into Fran & Barry at an inopportune time, running right past the snowshoes at least twice. They eventually smarten up, but continue to shed time to Eric & Jeremy. Out on the course, they've found the clue box, sending them to their final destination city, Denver, back where they started. Tyler apparently can't read the trail map and they have to back track, although BJ somehow stumbles upon the clue box up a hill, keeping them in tight with the Frats. They're both headed to the airport, with Ray & Yolanda picking up the rear again. Gamesmanship reigns at the airport, with neither of the leading two teams willing to tell the other which flight they're on. "Is it the million dollars keeping us apart?" asks Tyler. Well yeah, that and Eric's uncomfortable attraction to you that he can't admit. Meanwhile Ray & Yolanda's bad day on the road is mitigated by catching the same flight as the other two, making it a true three-way dash to the finish. The teams have to head to nearby Golden and Clear Creek History Park from the airport, searching the area for a clue. Eric & Jeremy find theirs first, with it sending them back to where they started originally, Red Rocks Amphitheater. After a couple of minutes of searching BJ & Tyler find a clue, and are hot on the Frats's tail. Ray & Yolanda manage to be slow even when someone else is driving them. Driving up to the park, Eric spots a clue box on the side of the road, and has the driver stop. It's a Roadblock, the final one of the race. Following up on last season's clever North America map, this roadblock has to find the flags of the countries that they visited on the race and place them in the order they visited them (Brazil, Russia, Germany, Italy, Greece, Oman, Australia, Thailand, Japan). This one's for the smart people out there. Eric is the "brains of the operation" and gets the final call. BJ & Tyler are coming up just behind, with BJ apparently the go to guy for flags. There is a reference guide for the flags, but there are extra ones included. Eric completes the first (Brazil) and last (Japan), but messes up the order of Germany and Russia. BJ & Tyler don't seem to have kept up with the socio-political events of the last decade and a half, and claim that Russia is not on their list. It's not the Hammer and Sickle anymore, dummies.